Blancspot iPhone App. Reading endless lines of black on white text? Bo-ring. Scrolling through dozens and dozens of RSS feeds? So overwhelming. Viewing gorgeous photos with the day’s headlines attached? Now we’re talking. We don’t watch the evening news in black and white. Why should we read the day’s headlines in such a one-dimensional way? Well, the developers at Blancspot Media say we shouldn’t. Instead, they offer us Blancspot iPhone App, a quirky new iPhone app that offers a hip, image-centric way of viewing the news. Open up the Blancspot app and it plays a cinematic sequence of stunning high-res photos that depict the headlines from around the world, as well as the top stories in Sports, Business, Politics, Culture, “War Room,” and the Planet. All these slideshows are set with smooth transitions and appropriate music, i.e. the Sports section plays an upbeat tune while the War Room has ominous tones in the background. (Truthfully, the music can be distracting at times.) At the bottom of the screen rests the headline for that image. Tap once to pause the slideshow and bring up the dashboard controls. Tap again to continue your viewing experience. If you’re impatient like me, you can swipe through all the pretty photos until you get to a story you want to check out. Intrigued by an image of a man donning a red and white Viking helmet? 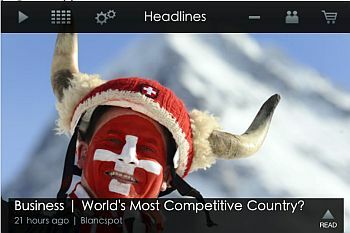 (Well, I was…) Click on the headline below—“World’s Most Competitive Country?”—and you’re taken to an editorial summary of said article, in this case, one that claims Switzerland is the big winner. Scroll down and you’ll see the “Read More” section with links to external sources like CNN and Forbes where you can (duh) read more about the issue. Tap on one of these links and out pops the news article within the app—no need to switch out to Safari here. Finally, there’s the “Engage” section, which has additional information and links to help you learn more about the given issue. 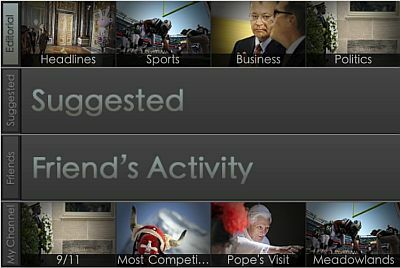 Every story you select is automatically paced in the your “My Channel” section for quick reference. 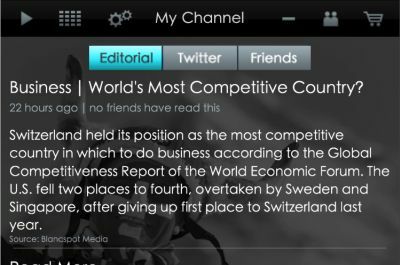 Want to let Sven, your buddy in Zurich, know that he resides in the “World’s Most Competitive Country”? Click the little people icon on the dashboard and up comes a screen allowing you to share this article with him via email, Twitter, or Facebook. Or if Sven’s got Blancspot on his iPhone, you can “Suggest” it to him and your fellow Blancspot buddies. Blancspot is adept in not only beautifying the news but also adding a social media component to it. If you select the blocks icon on the dashboard, you’re taken to a screen with four rows of images: Editorial (i.e. all the featured stories), Suggested (what articles your friends on Blancspot have suggested to you), Friend’s Activity (what your pals have been reading), and My Channel (what you’ve read). Of course, when you suggest stories to your Blancspot friends, that article will show up in their “Suggested” channel. Slick and stylish as it is, Blancspot app for iphone is not without its faults. My biggest gripe is the lack of actual news content; users pretty much get whatever Blancspot’s editors decide to post. So where are my Tech and Travel sections? Moreover, the slideshows are a bit slow in loading and display each image a bit too long for my taste. I’d love it if the app could toggle between portrait and landscape mode (currently, it’s a landscape-only app). And there should be an option to turn off the background music, so that I can listen to my own music while using the app. Overall, Blancspot’s polished design and unique premise far outweigh its few faults. It offers a new and unique way of taking in the news from your iPhone without straining your eyes and giving yourself a migraine in the process. So for naysayers who argue that the daily news can’t be stylish and entertaining, Blancspot’s out there now proving them all wrong. Get this Blancspot iPhone News app in iTunes apps store here for only $0.99.